The North American B-45 Tornado was the United States Air Force's first operational jet bomber, and the first jet aircraft to be refueled in the air. The B-45 was an important part of the United States's nuclear deterrent for several years in the early 1950s, but was rapidly succeeded by the Boeing B-47 Stratojet. B-45s and RB-45s served in the United States Air Force's Strategic Air Command from 1950 until 1959. The B-45 began development in 1944, when the War Department, alarmed by German jet bombers like the Arado Ar 234, called for a new family of jet bombers grossing between 80,000lb (36,287kg) and 200,000lb (90,718kg). The North American proposal (NA-130) won, and on September 8, 1944, the company began production of three prototypes based on the NA-130. The end of World War II resulted in the cancellation of many projects and delayed many others. In 1946, rising tensions with the Soviet Union caused the Air Force to assign higher priorities to jet bomber development and production. By mid-1946, the XB-45 and Convair XB-46 neared completion, but the XB-47 and Martin XB-48 were still two years away. The USAAF chose to evaluate the first two designs to determine which would be superior operationally. The B-45 proved a superior design, and on January 2, 1947, a contract for immediate production of B-45As was signed. It had been planned to equip five light bomb groups and three light reconnaissance groups with B-45As but as the B-47's development and flight testing made future production all but certain, the B-45's future became increasingly uncertain and in mid 1948 the Air Staff actually began to question the B-45's value. Soon afterwards, President Truman's budget restraints reduced Air Force expenditure and B-45 production was reduced to total of 142 airframes. Further budget cuts in the FY 1950 forced the Aircraft and Weapons Board to cancel 51 of the 190 aircraft on order. Continuously plagued by engine problems along with numerous other minor flaws, the B-45 regained importance when the United States entered the Korean War in 1950 and would prove its value both as a bomber and in a reconnaissance role. The mass dedication of U.S. Forces to the Korean War revealed the vulnerability of the North Atlantic Treaty Organization forces in Europe to Soviet attack and it was in this light that the Air Force made an important decision about the future of the B-45. The B-45, like all post World War II U.S. bombers, could carry both nuclear and conventional bombs. The progress of weapons technology had led to a great reduction in the weight and size of nuclear weapons in U.S. inventory, effectively allowing smaller aircraft such as the B-45 to carry out nuclear strikes, a mission which had initially been limited to heavy bombers. Suddenly, the small fleet of B-45s had great value again as a nuclear deterrent. Operation Fandango, sometimes called Operation Backbreaker, entailed modifications to the aircraft for nuclear missions. In addition, the 40 B-45s allocated to the program also were equipped with a new defensive system and extra fuel tanks. Despite the magnitude of the modification project, plus ongoing problems with the early jet engines, atomic-capable B-45s began reaching the United Kingdom in May 1952, and deployment of the 40 aircraft was completed in mid June. It was at about this same time that RB-45s of the 323rd Strategic Reconnaissance Squadron began to arrive in Japan to fly alongside the 91st Strategic Reconnaissance Squadron, supplementing the WWII era piston engine RB-29s which had proved to be easy targets for North Korean MiGs. The RB-45s would provide valuable intelligence throughout the remainder of the Korean War despite the limited number of airframes which were available. RB-45Cs flew many daylight missions until early 1952, when they were converted to night operations after an RB-45 was almost lost to a MiG-15. All 33 RB-45Cs built were assigned to the 91st Strategic Reconnaissance Wing's 322nd, 323rd and 324th Strategic Reconnaissance Squadrons. The RB-45C also flew several long-range reconnaissance missions over the Soviet Union during the mid 1950s. On July 29, 1952, an RB-45C made the first non-stop Trans-Pacific flight, having been refueled twice by KB-29s along the way. Maj Lou Carrington and his crew of the 91st Reconnaissance Wing flew from Alaska to Japan in 9hrs 50mins, winning the MacKay Trophy for their achievement. By 1959 the RB-45C had been replaced by the RB-47E. The only other nation to use the RB-45C was Britain, which were operated by an ad hoc unit of crews largely drawn from Nos. 35 and 115 squadrons. Four aircraft were bailed to Britain from the 91st Strategic Reconnaissance Wing to form a RAF special duty flight commanded by Squadron Leader John Crampton. With RAF markings, the four aircraft were attached to a USAF squadron based in RAF Sculthorpe, Norfolk, and the flight performed significant operations over the Soviet Union during a period when such overflight operations were restricted by the President of the United States. Three of the four RB-45C's carried out 'Operation Ju-jitsu' on April 17 1952, overflying Russia at 36,000 feet and gathering electronic intelligence and photographs of the targets before returning to Sculthorpe ten hours later. On April 28 1954 the three aircraft took off from Sculthorpe again, and on this occasion, Crampton's aircraft, heading for Kiev, was tracked by ground radar and came under anti-aircraft fire. Applying full power, he immediately turned and headed for Germany, none too soon as Soviet night fighters had been dispatched to hunt down his aircraft. By the end of the 1950s all B-45s were removed from active duty service. However, a few continued to act as test aircraft into the early 1970s. The first flight of the XB-45 was on 17 March 1947 from Muroc Army Air Field. A total of 131 test flights were flown by the three prototype aircraft, one being destroyed early on, killing two pilots. The USAF accepted one of the two survivors on 30 July 1948, the other on 31 August. One was damaged beyond repair in an accident. The last XB-45 was delivered to Wright-Patterson Air Force Base in 1949. It proved excessively difficult to maintain and was relegated as a ground trainer. 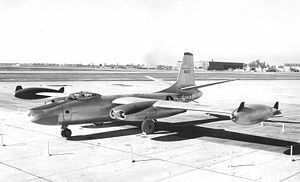 The B-45A differed from the XB-45 in having improved ejection seats and communications equipment, an E-4 automatic pilot, and a bombing navigation radar. The first production B-45 flew in February 1948. The Air Force took delivery of 22 in April 1948. They were powered by the less-powerful J35 turbojets, and not considered combat-ready. They were assigned to training duties and to conduct various test programs. The next batch were powered by the superior J47 turbojets. The first B-45As entered service in November 1948 with the 47th Bombardment Group. The initial order of 96 was completed in March 1950. The first B-45As were not equipped with bomb fire control systems or bombsights. They suffered from gyrocompass failures at high speeds, unhooked bomb shackles, engine fires, and inaccurate cockpit gauges. The AN/APQ-24 bombing and navigation radar on some B-45s was maintenance heavy and malfunctions in the pressurization pump limited the altitude at which it could operate. Fifty-five nuclear-capable B-45s arrived in the United Kingdom in 1952. These were modified with a 1,200gal (4,542l) fuel tank in the aft bomb bay. Despite technical problems, these were Tactical Air Command's first-line deterrent in Europe. The B-45B was a proposed variant of the B-45A with improved radar and fire-control systems. None were built. The B-45C was the first jet aircraft capable of aerial refueling. It carried two 1,200gal (4,542l) wingtip fuel tanks, had a strengthened canopy, and an in-flight refueling receptacle. The first B-45C was flown on May 3, 1949. Only ten were built, and the remaining 33 under construction were converted to RB-45Cs. Final production variant of the B-45. The bombardier's canopy was faired over and replaced with an oblique camera system. The RB-45C carried two 214gal (810l) external fuel tanks, or two JATO rockets. Up to 12 cameras in four positions, or a single camera with a 100in (2.5m) focal length lens, could be carried. The RB-45C first flew in April 1950, and were delivered from June 1950 to October 1951. 38 were built, including the 33 converted from B-45Cs.. It was this variant that was operated (clandestinely) over the Soviet Union by the RAF "special duties" unit at RAF Sculthorpe, with the first sortie of three aircraft commanded by Squadron Leader John Crampton taking place on the night of April 17th 1952. No. 35 Squadron RAF crews grouped into ad hoc units operated RB-45C variant. No. 115 Squadron RAF crews grouped into ad hoc units operated RB-45C variant. 91st Reconnaissance Wing operated RB-45C variant. 91st Strategic Reconnaissance Squadron operated RB-45C variant. 19th Tactical Reconnaissance Squadron operated RB-45C variant. Three B-45s have survived to the present day. B-45A (s/n 47-0008) is currently on display at the Castle Air Museum at the former Castle AFB in Atwater, California. B-45C (s/n 48-010) is on display in the Cold War Hangar of the National Museum of the United States Air Force at Wright-Patterson AFB near Dayton, Ohio, The aircraft was used by Pratt & Whitney for engine testing, and was flown to the Museum in 1971. The War of the Worlds (1953 film) shows stock footage of the B-45. A B-45 also featured prominently in the Buck Danny album 'Planes Without Pilots' by Jean-Michel Charlier and Victor Hubinon.